Spoon approximately 1/4 cup of the batter on each side of the waffle iron. What a wonderful idea - waffles! I've had pancakes, french toast, now I get to try waffles. I used the milk chocolate pudding mix for this recipe. I was careful with the first two waffles not to put too much batter, since the recipe indicated that they expand quite a bit. When I opened the waffle iron once they were done, I realized my mistake - not spraying the waffle iron with Pam. They were a bit hard to get off, and definitely not big enough to make a full waffle. I sprayed the waffle iron for the next batch, and made the waffle much thicker (making only one waffle instead of two). This made it much easier to remove the waffle. I drizzled with Walden Farms syrup. The first two waffles were nice and crunchy on the outside, but lacked any insides! 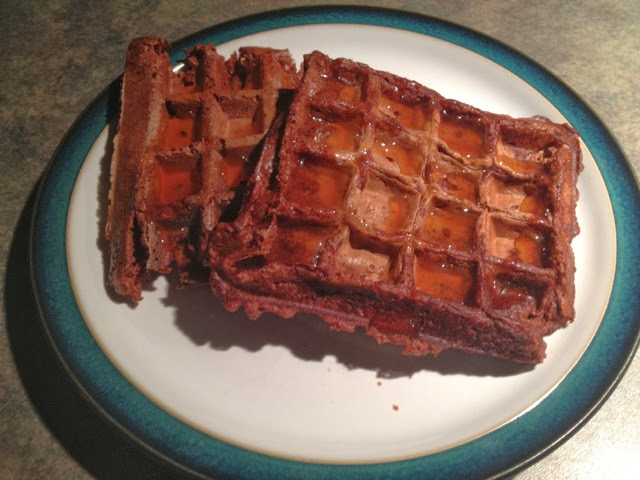 They were somewhat airy and not the soft yet firm insides of regular waffles. The flavour, however, was nice. The second waffle looked like it was quite dark, almost burnt, but not quite. So I definitely would not have wanted to cook it any longer. However, as I cut into it, it became apparent that it was not cooked enough in the middle. I was hoping that the thicker waffle would have a firm inside, but it was definitely undercooked. So I had two waffles that were too thin and crunchy, and one that was thicker, but undercooked on the inside. Overall, the waffles are a nice idea, but I think I'll stick to the pancakes made from the Ideal Protein Crispy Cereal (http://idealproteinrecipesandfoodreviews.blogspot.ca/2013/08/review-of-crispy-cereal-pancake.html) from now on! !